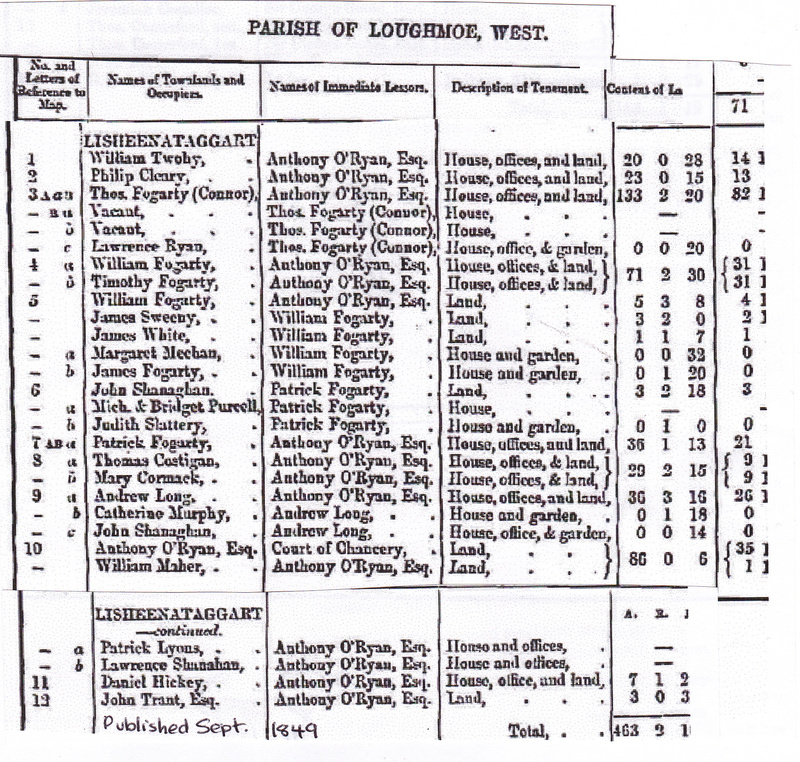 William Fanning of Clondoty was married to Catherine Fogarty of Lisheenataggart in Loughmore West Parish Co Tipperary Ireland. 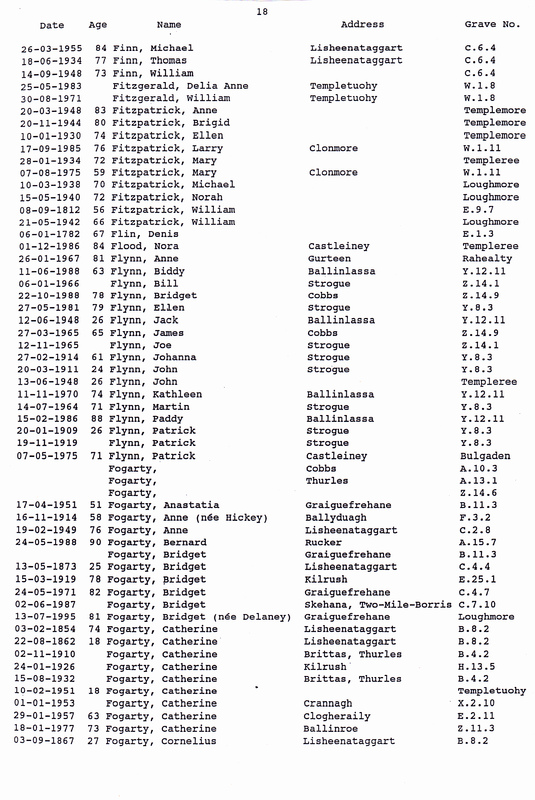 Her father was Thomas Fogarty and her mother was Honoria Long. 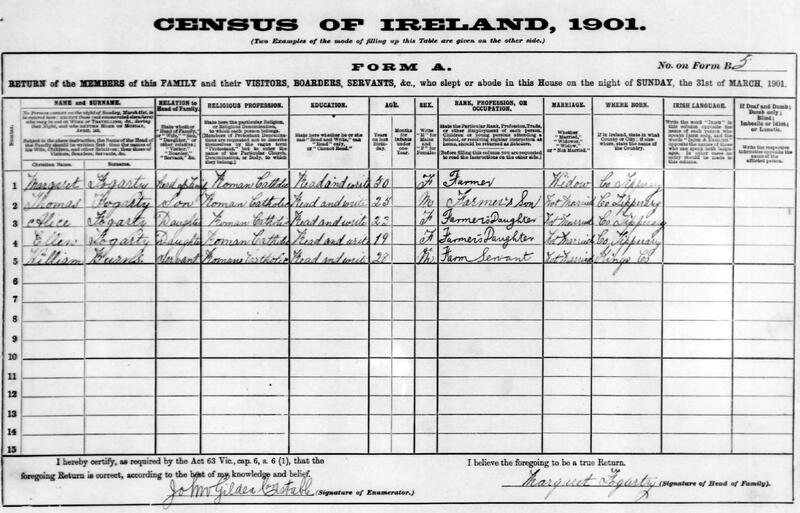 She had a sister Anne Molloy nee Fogarty. 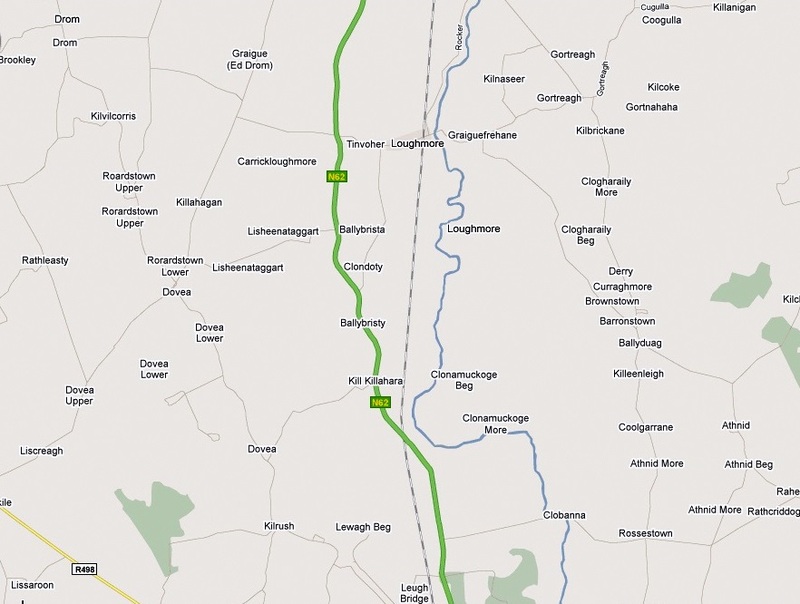 Thomas Fogarty did not have any sons so he bought the Clondoty property off his cousin, also called Thomas Fogarty, and gave it to his daughter Catherine and son-in-law William Fanning. 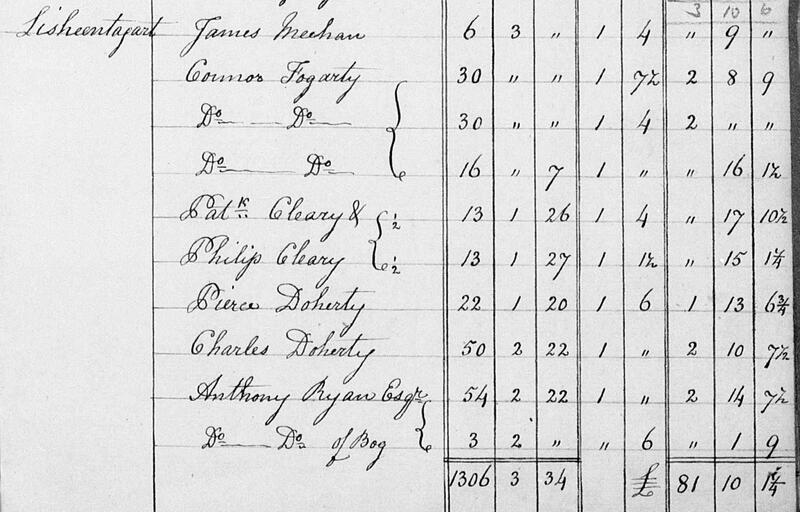 William and Catherine Fanning at Clondoty and raised their family of fifteen children there. 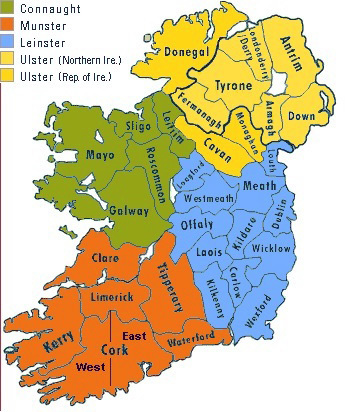 There are still Fanning descendants living at Clondoty today. Fogarty Catherine died 28.8.1862 aged 18 years, Cornelius died 3.9.1867 aged 27 years, Ellen died 9.6.1879 aged 28 years. Fogarty Catherine, erected by Cornelius Fogarty of Lisheenataggart in memory of his wife who died 3.2.1854 aged 74 years, the above Cornelius died 8.11.1868 aged 96 years. Fogarty Cornelius died 13.7.1774 aged 27 years. Fogarty Honoria, erected by Daniel Fogarty of Whitefield in memory of his wife who died 12.11.1912 aged 75 years, above Daniel died 12.2.1915 aged 74 years, his son Michael of Graigue, Drom died 3.4.1932 aged 57 years and his wife Alicia nee Looby died 15.10.1915 aged 87 years. 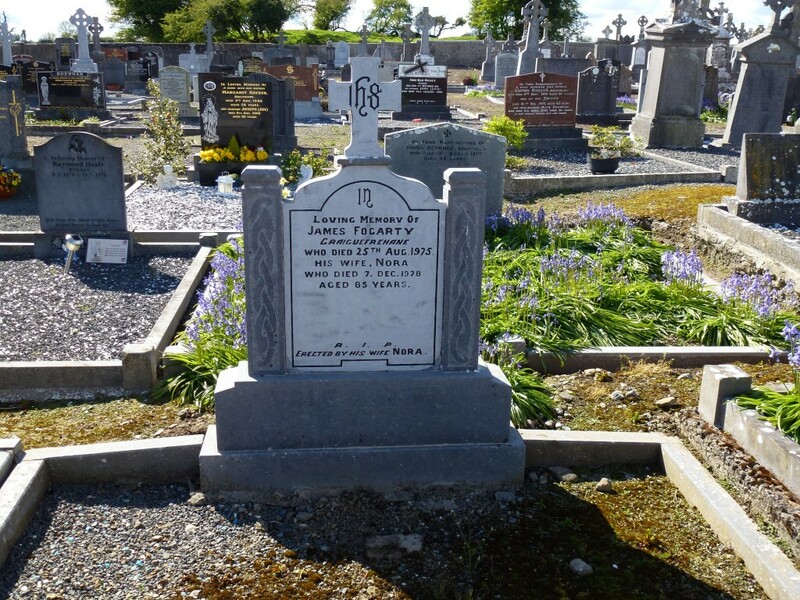 Fogarty John Esq died 3.6.1927 aged 80 years, his wife Nannie, of Dublin died 24.7.1896. 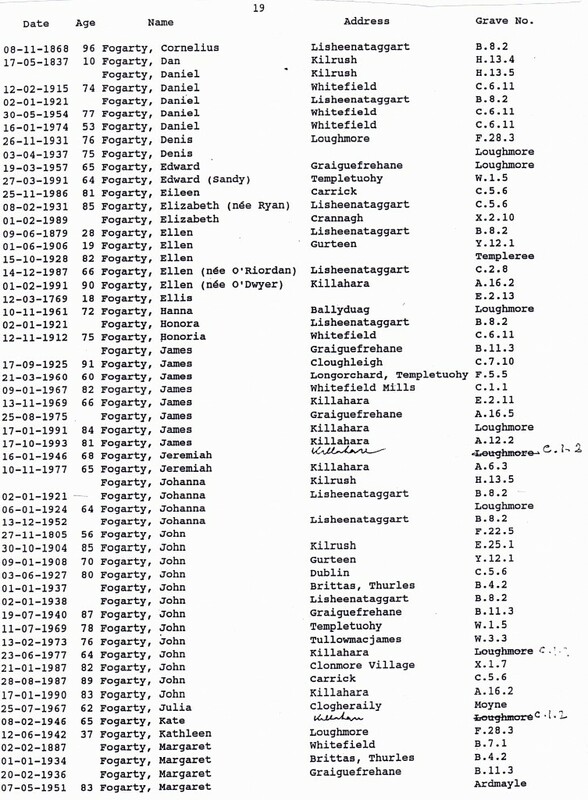 Michael of Lisheenatagart died 23.1.1935 aged 79 years, his wife Elizabeth died 8.2.1931 aged 68 years. 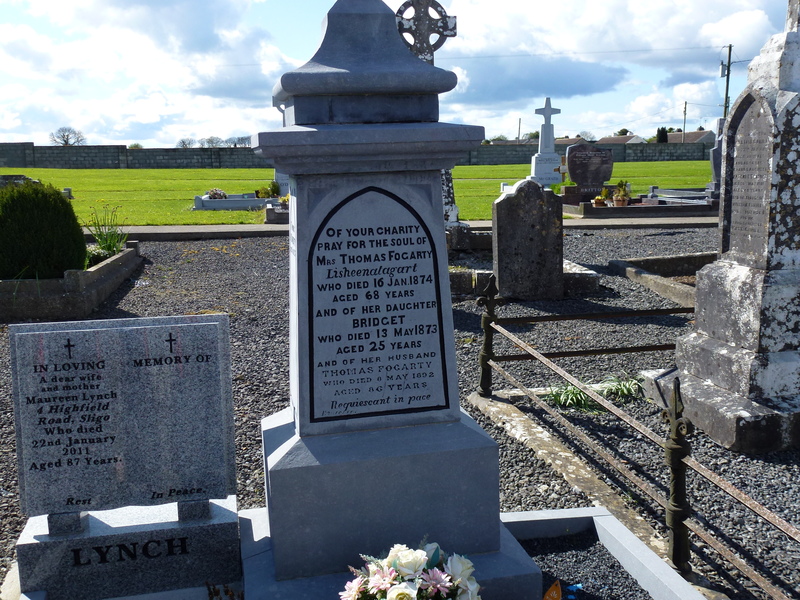 Fogarty John, erected by Richard Fogarty in memory of his father John Fogarty of Kilrush who died 30.4.1904 aged 85 years and his sister Mary died 15.7.1896 aged 26 years, his mother Bridget died 15.3.1918 aged 78 years. Fogarty Michael and his wife Mary nee Hayes died 17.9.1925 and 18.12.1928 respectively, daughter Mary died 3.10.1909, Michael Fogarty of Skehane of Two Mile Borris died 27.6.1971 and his wife Bridget died 2.6.1987. Fogarty Mrs Thomas Fogarty of Lisheenataggart died 16.1.1874 aged 68 years, daughter Bridget died 13.5.1873 aged 25 years, her husband Thomas died 8.5.1892 aged 86 years. 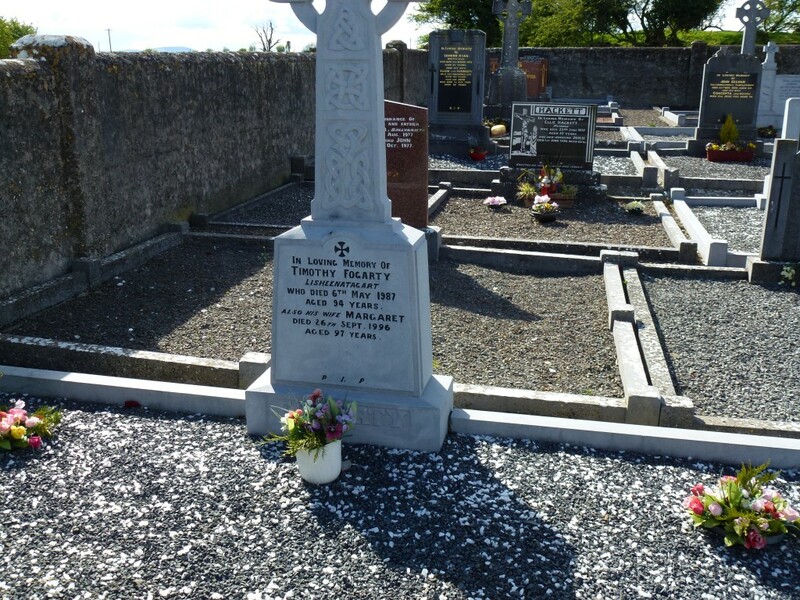 Fogarty Patrick and Mary, erected by Denis and William Fogarty of Loughmore in memory of their father and mother, Patrick died June 1863 aged 60 years, Mary died March 1915 aged 84 years, also their sister Mary May died 1875 aged 25 years and Sarah wife of William died May 1899 aged 40 years. 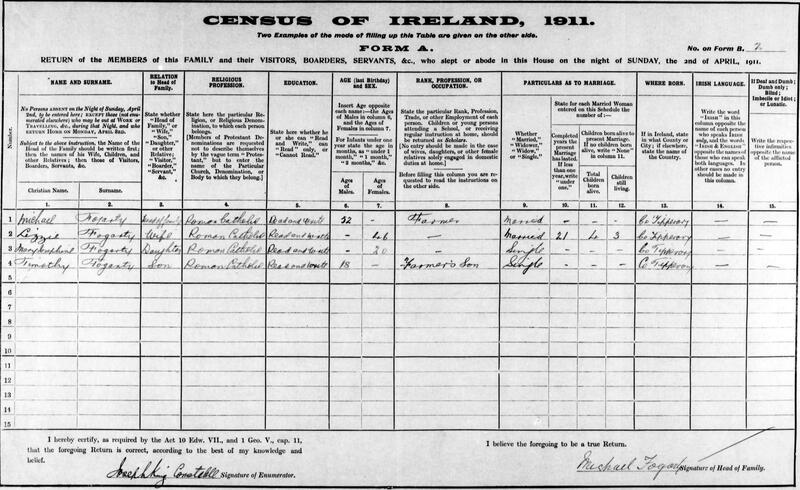 Above William died 16.8.1921 aged 61 years, Denis died 26.11.1931 aged 76 years, his wife Mary died 21.5.1949, their daughter Kathleen died 12.6.1942 and their son Patrick died 1.12.1974. 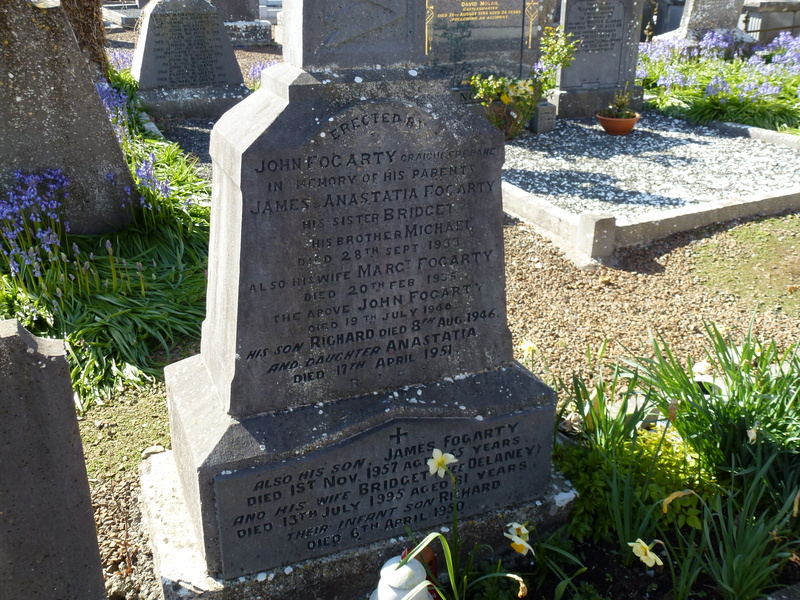 Fogarty Timothy of Lisheenatagart died 20.1.1887 aged 76 years, his wife Mary nee Hayes died 1.1.1885 aged 65 years, Eleen nee Carrick died 29.11.1986. John died 28.8.1987. 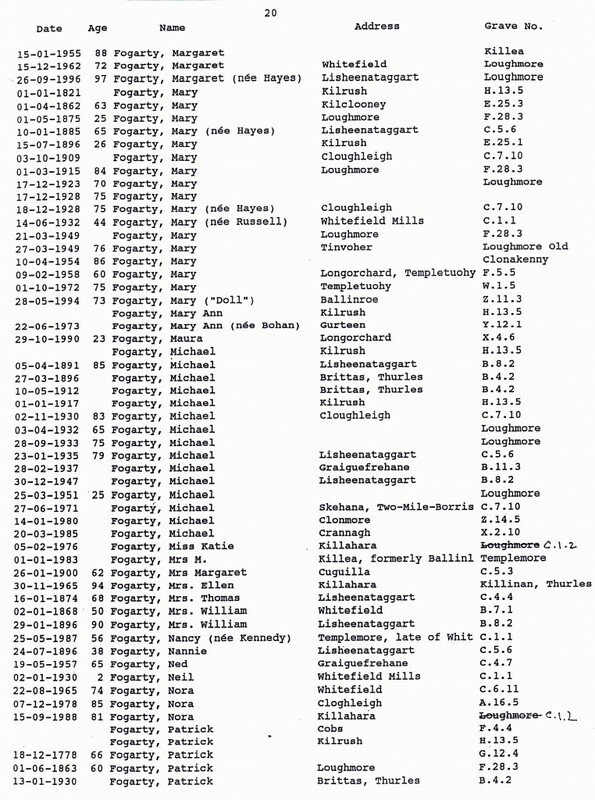 Fogarty William of Longorchard, Templetouhy died 16.7.1970 aged 85 years, his wife Mary died 9.2.1958 aged 60 years, also his brother James died 21.3.1960 aged 60 years. Fogarty William of Templetuohy died 15.3.1964. Fogarty William, erected by Mrs Fogarty of Lisheenataggart in memory of her husband who died 22? And her son Thomas died 10.11.1893 aged 38 years and Mrs Fogarty died 29.1.1896 aged 80 years. Fogarty William, erected by Mrs McDonald in memory of her father William Fogarty of Kilglooney who died 28.7.1873 aged 78 years, his wife Mary died 7.4.1862 aged 63? Years. 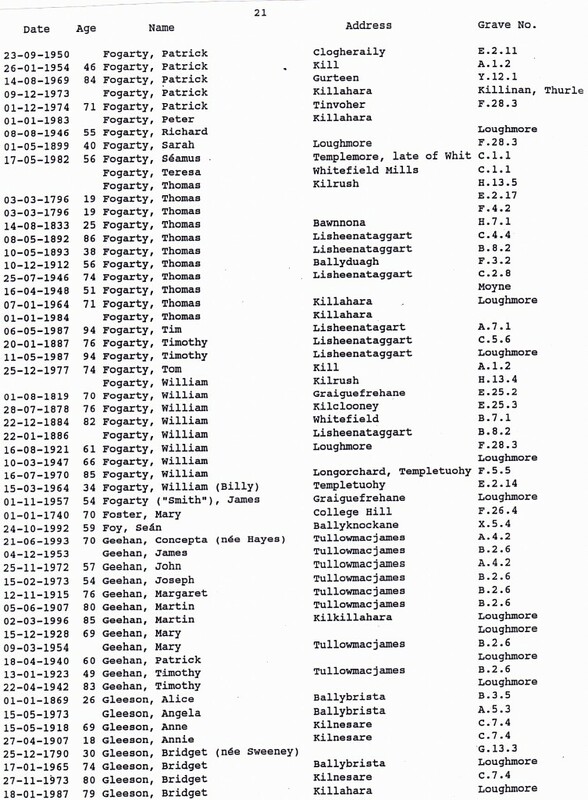 The following pages are from “Loughmore Parish Index to Burials in Loughmore and Templeree Graveyards” which is in the Thurles Library in Co Tipperary. 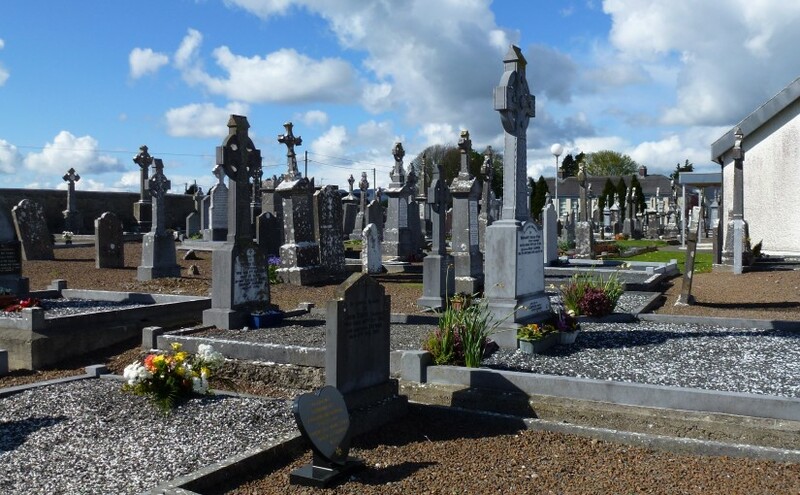 Below are photos of some Fogarty graves in Loughmore Cemetery.